Looking for a driving experience with a difference? Then look no further, this activity provides the ultimate in off road fun. You will have delight in taking control of these mighty machines, enjoying a mind-boggling rush of power & adrenaline rush. These ex-serving vehicles have immense power and off-road capabilities and will plough through mud & water, crushing anything in the way. Whether you are riding as a passenger or want to drive the tank yourself a tank driving experience is the ultimate activity for any military enthusiast and is the ultimate in fun. Looking for a driving experience with a difference? Then look no further, this activity provides the ultimate in off road fun. You will have delight in taking control of these mighty machines, enjoying a mind-boggling rush of power & adrenaline rush. These ex-serving vehicles have immense power and off-road capabilities and will plough through mud & water, crushing anything in the way. 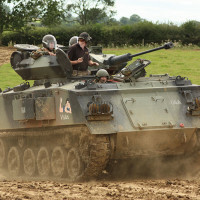 Whether you are riding as a passenger or want to drive the tank yourself a tank driving experience is the ultimate activity for any military enthusiast and is the ultimate in fun.